Hi Andreas, thank you for your time and welcome to Alternative Magazine Online! Thank you for having me and for your review. 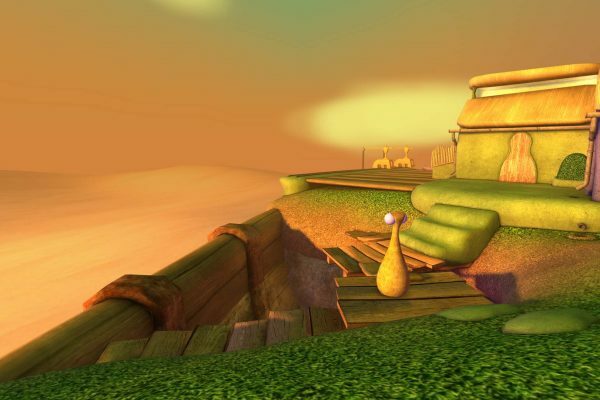 When, where and how was beyondthosehills conceived? Is there any particular meaning behind the studio name? 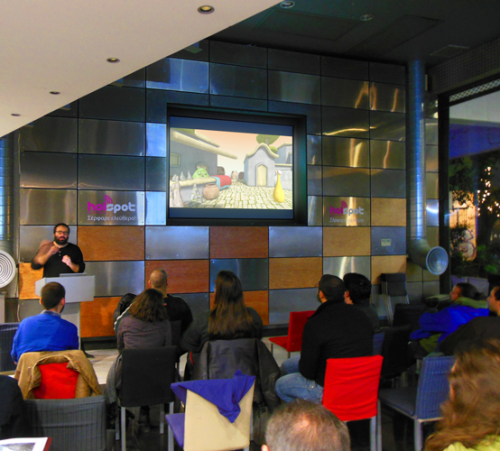 A typical morning in March 2011, I came in the office and said “Let’s start making video games!” There was an office in downtown Athens/Greece at the cultural space ABOUT: which my wife Maria and I had founded in 2010. We have organized over 100 cultural events over the years, such as contemporary-classical music concerts, contemporary art exhibitions, lectures and workshops. How did the game change between the original release and the new (final?) version, A New Beginning? It has changed a lot! Actually, we could say that it is a quite different game as far as the graphics, music, puzzles, the user interface, and the overall feeling are concerned. The only things we kept from the early versions were the main story (and backstory), the characters and the topology of the world. What is the technology that powers the game? 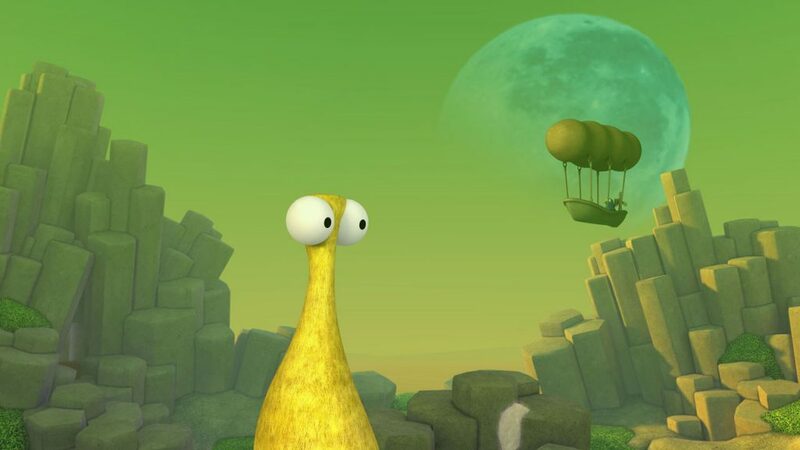 The game was made with Unity and we were extremely happy when Unity recently added our game to their showcase gallery. 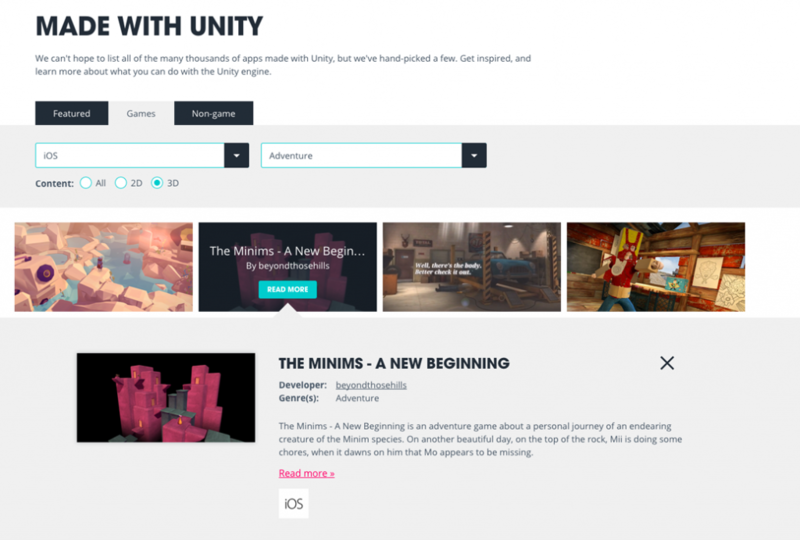 Even if most people may believe that Unity offers a lot of out of the box solutions for game developers, most professional game developers would agree that in order to achieve a specific result, there are a lot of custom-made features you have to develop. So do I. For the graphics part, I mainly used Lightwave. I know… not a common solution for game productions, but actually I’m very familiar with it since I have been using it for many years now, so it was the obvious choice for my workflow. Nevertheless, I think it’s a great 3D software, but I fully understand why it’s not preferred by the game production industry. Minim is the singular of Minims, which is a species of creatures in the world I have created. It is not the main species of that world but it’s definitely the main species in our story. The characteristic of these creatures is their minimally shaped curvy body with a pair of eyes. So we decided to call them Minims as an abbreviation from the word minimal. Actually, we have a whole background story about the Minims and the world they exist in, which we would be grateful to exploit if a future opportunity arises. The storyline feels deceptively simple at first but eventually deals with some pretty interesting themes. Did you want to leave some interpretation of Mii’s journey up to each individual player or is there a definitive explanation for the events that occur? The story I have in mind is very specific. The events that occur have been designed and meticulously placed in a specific space-time frame. But there are a lot of things that we don’t clarify or reveal to the player. For example, we don’t say much about the story of Mo, or who the Elder-Minim is, nor what his particular role in the story and the lives of the Minims is. And of course, there is the “Intermission”! At this point, I would like to clarify that my intention is not to define what is right or wrong or what someone has to do with his life. I just present the story of the characters I have created. This is the story of Mii. So when you have to choose to follow the path, you don’t choose for yourself. You choose on the behalf of Mii. It’s a predestined story. 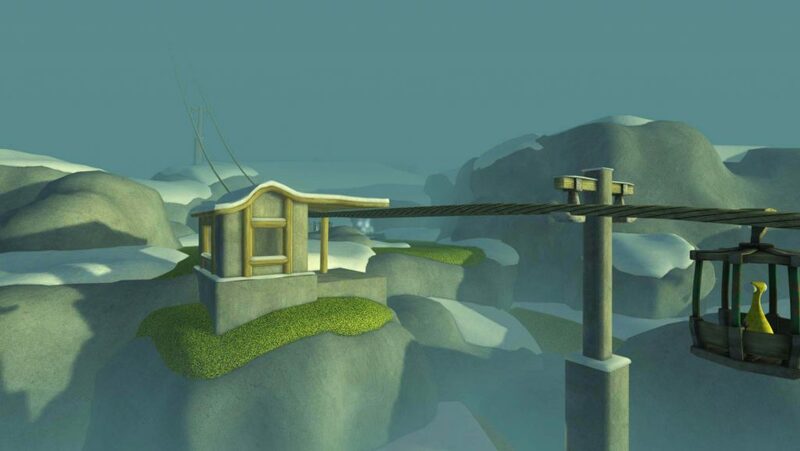 Nevertheless, there will always be room for free interpretation on an abstract level about Mii’s journey that each individual player can make. Hurray! Our game has been selected from Unity and added to their #madewithunity showcase. Come ormai ben sapete, a noi piace particolarmente segnalarvi i migliori indie game in circolazione che, pur non godendo di alcuna fama e particolare pubblicità, meritano comunque di essere notati e soprattutto giocati. 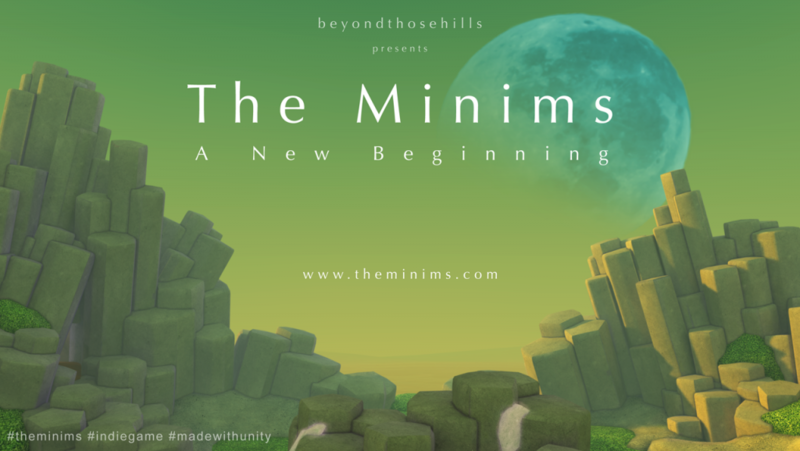 È proprio questo il caso di The Minims – A New Beginning, un titolo creato dai ragazzi di beyondthosehills studios, un piccolo team di sviluppo situato in Grecia. In questa avventura incontreremo Mii, un simpatico Minim che intraprenderà un importante viaggio alla scoperta di sé stesso e, soprattutto, alla ricerca di Mo, la sua compagna scomparsa misteriosamente. Ciò che caratterizza questo particolarissimo gioco è proprio il fatto che non andremo a vestire i panni di nessun personaggio. Per interagire con l’ambiente dovremo infatti “puntare e cliccare” su oggetti e personaggi per scoprire cosa accade al nostro passaggio, risolvendo così enigmi e rompicapi il cui superamento significherà un importante passo avanti per il Minim. Ciò farà di noi un’autentica guida spirituale per Mii: dovremo infatti guidarlo verso la buona strada da percorrere, lasciandoci magari guidare dalla perfetta colonna sonora – composta da Maria Aloupi – e dalla grafica semplice ma in grado di regalare emozioni visive difficili da dimenticare. 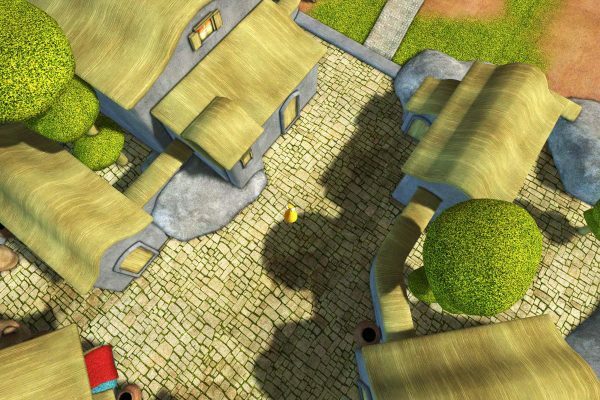 Non è semplice descrivere un gioco tanto semplice quanto delicato come The Minims – A New Beginning, il mio consiglio è quindi quello di scaricare questo incantevole indie game, per immergervi nel mondo di Mii e rimanere stupiti così come lo sono rimasta io. 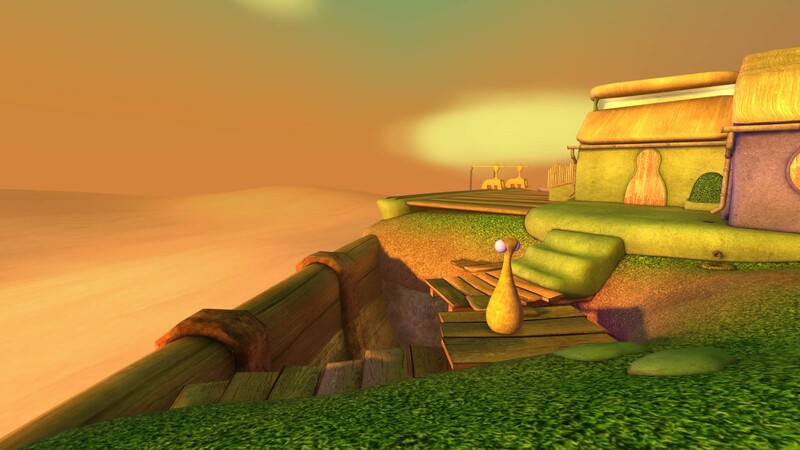 Although The Minims – A New Beginning is currently only available for smaller mobile devices, the graphics immediately convey a sense of quality and – perhaps most important of all for a game about undertaking an epic journey – scale. 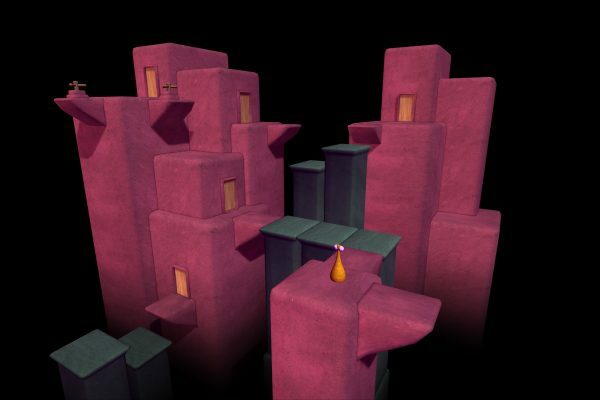 Mii lives with Mo ‘on the top of the rock’, a towering pillar high above a desert wasteland. 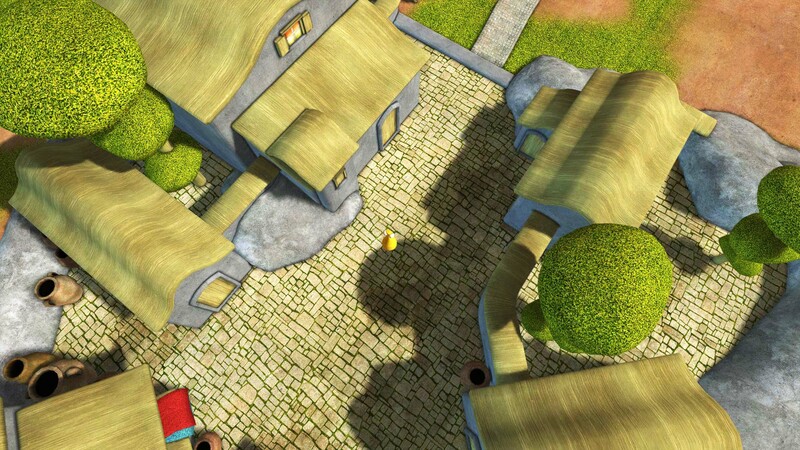 A furry yellow limbless creature with large protruding eyes, players must wake Mii to start his day by making a spider come down from his bedroom window… and blow a trumpet. 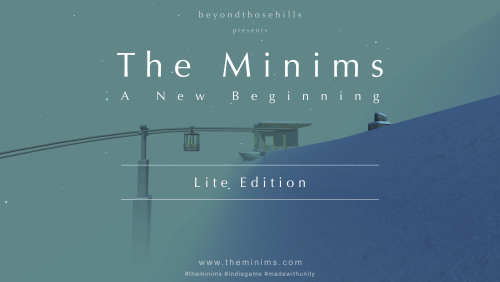 The Minims – LITE edition now on iOS for FREE! 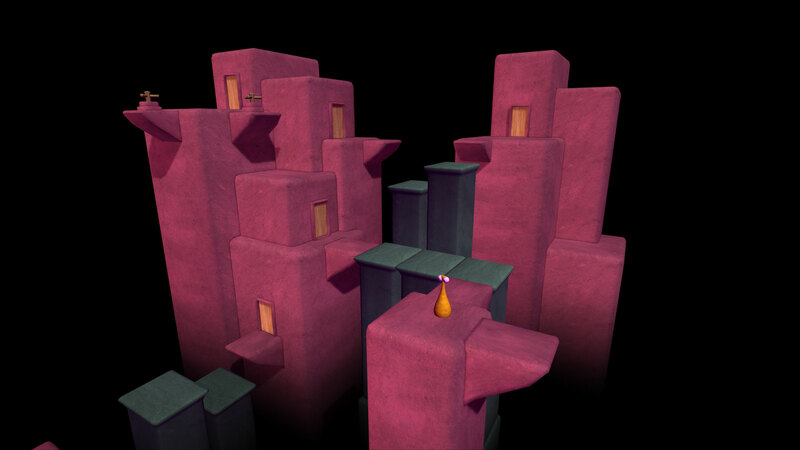 In the LITE edition, the player is introduced to the Minims world through several snapshots of the story. + major optimisation for very old devices [iPhone 4 early version]. No more crashes in Interlude (even in my iPhone 3GS)! After the last Major update on the end of February 2015, we decided that we didn’t like the user interface [menus, task manager, achievements menu…] very much, so we started to redesign the whole UI from the scratch. 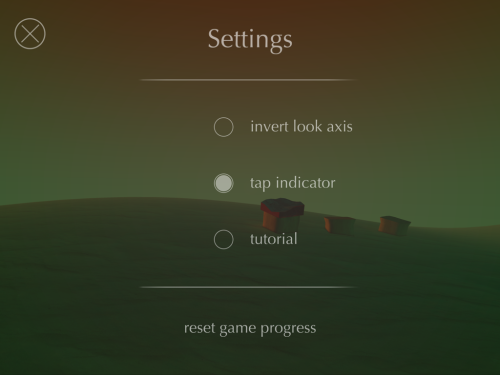 All the code for the new UI is a custom code in Unity without the help of GUI layer or the new Unity UI system. 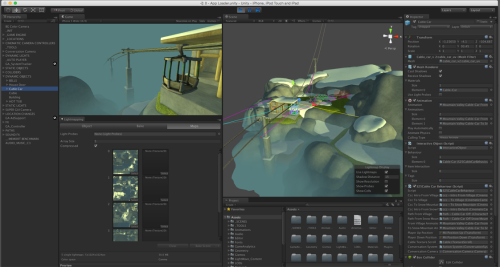 After experimenting a few days with the Unity new UI system we found that it was too risky at that stage to use it. So we build some custom classes to manage a custom UI system with dynamic capabilities for multiple screen sizes. Check out for the new update and have fun! 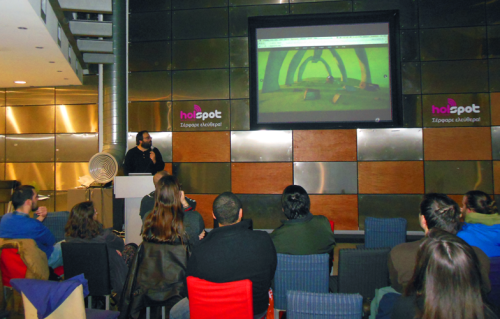 We presented our game “The Minims – A New Beginning” to our greek developer friends for the first time. Here we are, with the final version of the game! In this version, we changed all of the 1s chapter’s puzzles, as well as some of the puzzles from chapter 2. 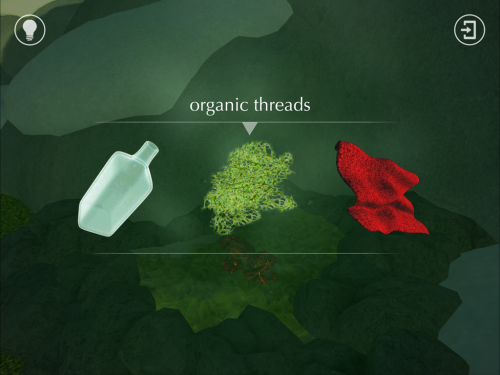 We also added a few storytelling details throughout the game. These changes were necessary for the consistency of the game’s mechanics and storytelling. 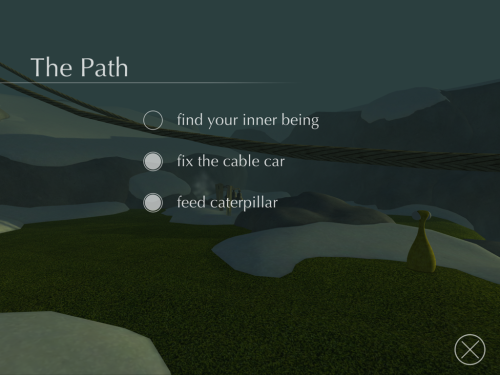 In addition to that, we improved the UI and some in-game graphics. Finally, we introduced the sub-title “A New Beginning” which reflects the storyline of the complete game. It was December the 20th of 2012. 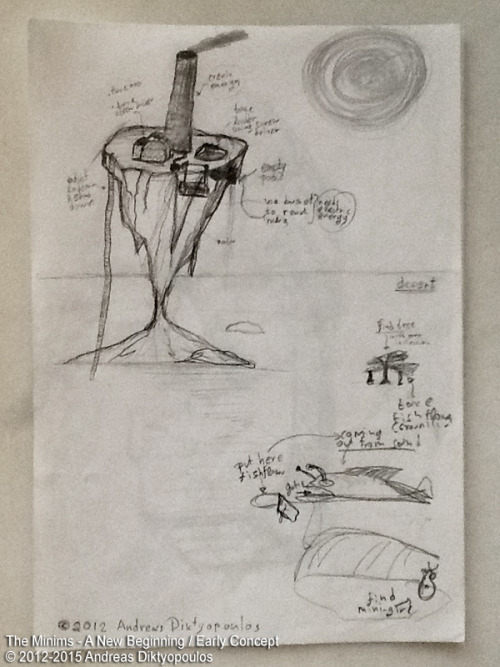 Andreas was sitting at his desk, making some sketches on his notepad. You could definitely tell that he was preoccupied. 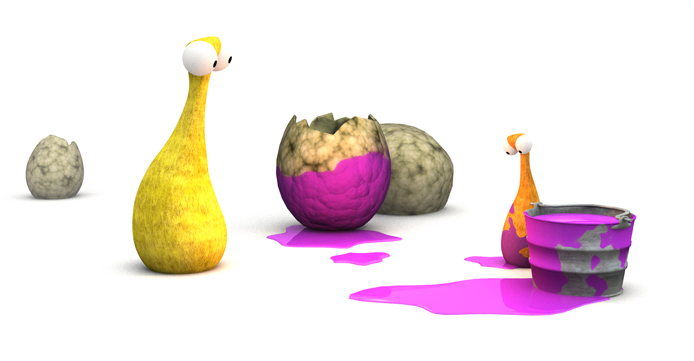 After several sketches, he turned on his iMac and started modelling a 3D object. 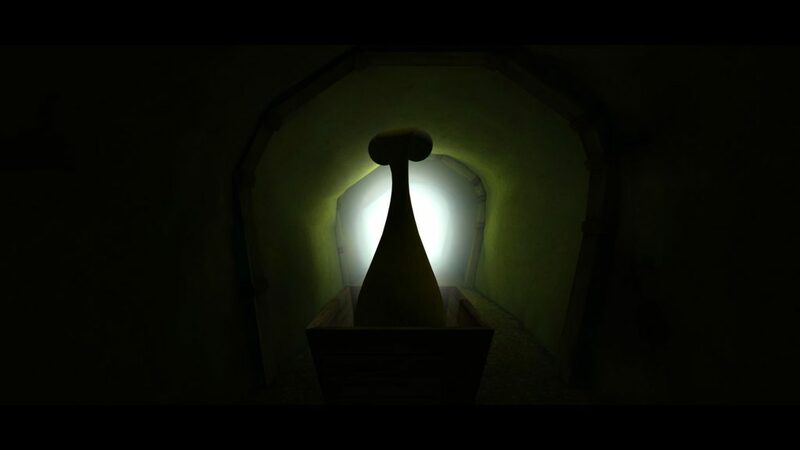 Then he called Maria to show her the first of the Minims. It was Mii & Mo. 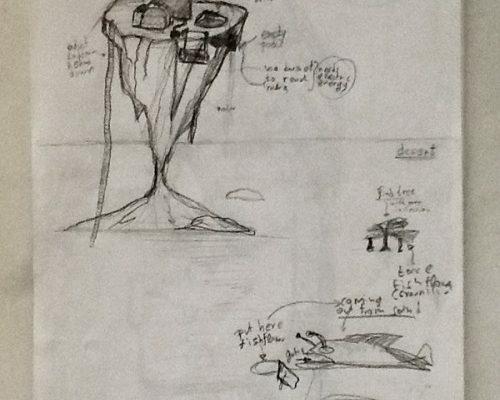 Somewhere among his sketches was an enormous rock, in the middle of a vast desert, with three buildings standing on top of it. This was to be their home. And thus the Minims universe was born!